A P J Abdul Kalam will face just one challenge when he formally takes over as President today. This challenge is rooted in the simple fact that the distinguished defence scientist -- who is shifting from his single-room abode to Rashtrapati Bhavan, arguably the largest and most opulent residence of a head of state in the world -- is not a member of the Indian political class. Some even say he is an 'outsider' who will have to learn his new, exalted role on the job. There is no doubt that, beginning with Dr Rajendra Prasad, the first president and the only one so far to have two terms, all heads of State of this country have been veteran politicians who ascended to the presidency after long innings as ministers, chief ministers, governors and so on. Dr S Radhakrishnan may not have been a professional politician, but his experience in public affairs was enormous, including a spectacular stint as ambassador to the Soviet Union in the Stalin era. Dr Zakir Husain, though primarily an educationist, was deeply involved in national politics and the Freedom Struggle in close association with Mahatma Gandhi. Even the case of K R Narayanan, who is retiring after a glorious innings, is vastly different from that of Kalam. The outgoing President was a professional diplomat, not a politician. But his political grooming began immediately after his retirement from the Foreign Service and was prolonged and thorough. True, he was only a minister of state in Rajiv Gandhi's government, while there were leaders like P V Narasimha Rao, Pranab Mukherjee et al who were much senior to him. However, his election as vice-president in 1992 provided him not only with valuable experience but, protocol-wise at least, seniority over the then prime minister, Rao, to say nothing of lesser political figures. 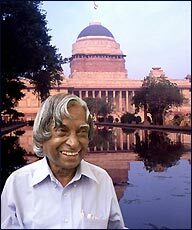 Kalam, an outstanding technocrat rightly acclaimed as India's 'missile man,' is the first individual to pole-vault into Rashtrapati Bhavan without going through the useful apprenticeship of vice-presidency. This has created some anomalies. For instance, Defence Minister George Fernandes, whom Kalam served, is still defence minister. But that can't be helped. Kalam is now India's First Citizen and head of State. All others must adjust to this reality. Some civil servants senior to him are also holding office, though the eminently deserved Bharat Ratna award gives Kalam a position equivalent to former prime ministers. Kalam's enormous popularity should prove useful in overcoming these problems. It is not merely that the easily predictable margin of his victory over Colonel Lakshmi Sehgal is overwhelming. The respect he enjoys among the people at large, not just among the educated middle class, is heartwarming. Whatever Sehgal's supporters said about him was no more than electoral rhetoric that nobody took seriously. For his part, Kalam, a man of high calibre, sterling integrity and Spartan habits, cannot do better than adopt Narayanan as his role model. If he does that, he could easily convert his challenge into an opportunity to do the country yeoman service by bringing about a healthy balance and harmony between the head of the State and the head of the government. This requires some blunt explaining because this country, being totally disinterested in history, does not know of the tug-of-war that constantly takes place between its presidents and prime ministers. This has happened even when presidents were derisively dismissed as 'rubberstamps' and prime ministers like Indira Gandhi or her son, Rajiv, understandably considered all-powerful. If differences between Rajendra Prasad and Jawaharlal Nehru did see the light of day, it was because Prasad was assertive about his rights. He insisted he had certain discretionary powers, independent of the advice of the council of ministers. The then attorney-general M C Setalvad firmly told him there was no such thing. Whereupon, in a public speech, Prasad demanded an authoritative study of 'presidential powers,' but nobody paid any heed to him. Even Giani Zail Singh, who had started by declaring that he would, if so asked by 'Indiraji,' pick up the 'broom and sweep the floor,' ended up by unleashing on Rajiv Gandhi a war of nerves so ferocious as to shake the young prime minister. On one occasion, even Shankar Dayal Sharma obstructed the appointments of governors until some of his demands were met. Why is the problem so seemingly irremediable when the Constitution and the country clearly want the president to be a constitutional head of state, like the British monarch, wielding no executive power but having the right to 'caution,' 'advise' and 'encourage' the prime minister? Even when the country raged against the president's signature on the Emergency proclamation, the maximum Parliament was prepared to concede was that the president could return to the council of ministers any of its recommendations for reconsideration only once. If the ministers reaffirmed their decision, it was to be binding on the president. And yet the irony is that when President Narayanan very properly refused to sign the Vajpayee government's dubious proclamation for the imposition of President's rule in Bihar, the Hindutva party attacked him for being 'unduly activist.' Under similar circumstances, Narayanan had also rejected the Gujral government's recommendation for clamping President's rule in Uttar Pradesh. Inder Kumar Gujral and his colleagues had the good sense to accept the President's decision gracefully. Narayanan has also spoken out in defence of Indian values, be it secularism or nonalignment, sometimes to the chagrin of the ruling party. R Venkataraman had also acted as a 'copybook president,' to use his own words. He propounded the theory that the President, in the Indian scheme of things, was like the emergency light. It automatically came on when the normal flow of power was broken and went out after normal working was restored. If Kalam follows these two predecessors, he cannot go wrong. In one respect, Narayanan is a worthier example to follow. He speaks rarely but, when he does, it is with due and deep thought and without fear of favour. In the past, Kalam has shown a tendency to speak out all too often or to speak in the manner of a pedagogue. As President, he should control these proclivities. One more point may be pertinent. Although no president after Rajendra Prasad got a second term, I know of no president who didn't want a second term or didn't try for it, covertly or overtly. Kalam could earn tremendous kudos and set a fine precedent for future presidents if he disavows any ambition to have a second tenure at this new phase in his career that a billion Indians look forward to.